by Donald E. Zimmer. The Alban Institute, 2011. 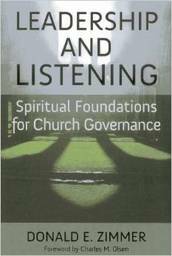 Growing out of several years of participation in the Center for Creative Leadership, leadership consultant Donald Zimmer presents a well-researched analysis of the powerful relationship between the processes of congregational leadership and spiritual discernment. He affirms that congregational leaders must intentionally change the way they do business if they want to know where the spirit of God is leading them. Modern congregations often have their governance structure modeled after corporate business structure and practiced using parliamentary procedure. These often fail to address discernment: what is God calling the congregation, group, or board to do? Zimmer’s work is based on research with more than one hundred church leaders. It offers intentional and practical resources for shifting the business of the church from within using resources of listening, prayer, worship, reflection and attention to community needs. Congregations of all types should benefit from this useful, easy to ready and relatively short book.